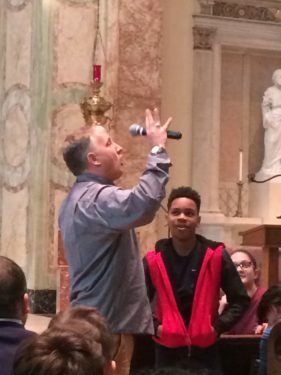 Nationally known youth speaker, Bob Perron of Stooge4Christ ministry, above, gave the keynote talk at a recent Junior High Youth Rally, organized by the diocesan Office of Faith Formation at St. Mark Church, Sheepshead Bay. More than 500 youth from nine Catholic academies and schools participated. Steve “Mr. Steve” Pulick provided music, and Kenny Wodzanowski of the Bensonhurst Cluster Youth Ministry assisted with the day. Father James Kuroly, pastor of St. Rose of Lima, Rockaway Beach, celebrated Mass, and Father Michael Panicali, St. Mark’s parochial vicar, concelebrated. There was also a toiletry collection for Midnight Run.